Non fa in tempo a uscire il suo nuovo album - Lawn Ornaments, l'ottavo da solista, portentoso, fresco di stampa per ReR - che Bob Drake già pensa al prossimo, 20 Nitre-Encrusted Hits. Incorreggibile! "My 8th solo album. Since my previous album had a deliberately stripped-down production, the moment I finished it I wanted to do an "overproduced" album. This was the starting point and general direction for Lawn Ornaments. It is very dense, yet still has a lot of space even in the most overdone passages, as well as some sparser moments too for a little contrast. More organ and piano than any of my previous albums, and features my first-ever trumpet playing, which is sure to please or repulse depending on the listener's constitution. Musically, it continues my attempts to come up with the best songs I can, the sheer joy of playing and singing, recording, microphones, amps... always reaching for that good feel, oh you know, make some good music with plenty of laffs and surprises and thrills of various kinds. 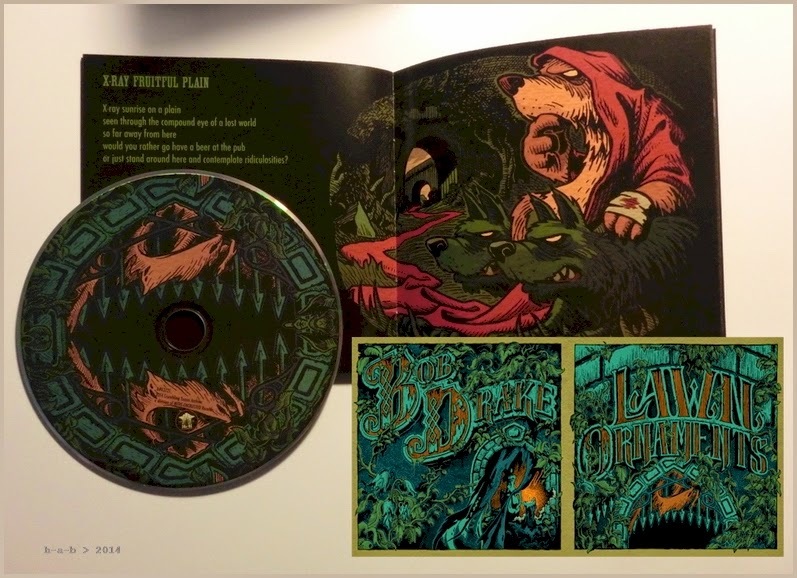 The artwork includes the cover and 16 more illustrations by fine artist Joe Mruk and is absolutely gorgeous, so I do encourage you to get the CD rather than an art-less digital download."